World Health News video to explains "What is Vision Therapy?" Vision Therapy is a type of physical therapy for your eyes done under the supervision of an eye doctor specially trained in this field. It is a highly effective non-surgical approach to improving conditions such as eye strain, lazy eye, double vision, vision that blurs in and out of focus, and many other eye problems. Vision therapy is specifically directed towards your individual vision problems and it is NOT a “one size fit all approach”. 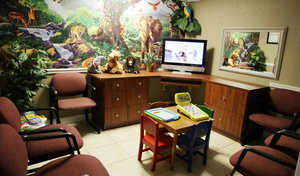 This picture is our children's waitng area and vision therapy room. Vision therapy sessions are only done after office ours because it requires time, patience and concentration for success. You meet one on one with the Optometrist once a week for a 30 minute session. During this session, the doctor introduces you to your new exercises for the week. Each day, you practice the exercises for 30 minutes at home. There is a deposit that is added to your initial 10 session package for equipment rental. If all of your equipment is returned in good shape, your complete deposit is refunded. How long does Vision Therapy take to get results? You will notice results in as few as 2-4 sessions. To completely correct some of the simpler problems such as convergence insufficiency can take as few as 10-12 sessions. More complex problems may take 20-30 sessions. The fastest results are achieved depending on how hard a person works on their exercises at home, how long the person has had the problem, and the age of the patient. In general, a young child is easier to treat than an adult. How can I tell if I am a good candidate for Vision Therapy? At your complete eye exam, Dr. Fischer will discuss your symptoms with you and whether you are a good candidate. Before you register for your weekly sessions you have to have a Vision Therapy evaluation which is for a 30-60 minute exam. If I just had an eye exam do I need to have another one in your office? If you bring your results of your exam to our office, the doctor may not have to repeat certain tests such as the eye dilation. However you will need to get the Vision Therapy evaluation which includes tests that are not commonly done during the regular eye exam. What research has been done to show the efficacy of Vision Therapy? Dr. Fischer is proud to have been a clinical researcher for two major studies at Bascom Palmer: The Amblyopia Treatment Studyand the Convergence Insufficiency Treatment Trial. A 10 session package is $1,000. Each session is 30 minutes one on one with the doctor. Both cash and check are accepted, but Vision Therapy is currently NOT covered by insurance.